Test series between South Africa and Australia have always been ultra-competitive and it was no different this time. Heading into the third match, the series was tied at 1-1 and the winner would take home what was a highly charged up series. Australia dominated the match and after setting South Africa an improbable target of 510 runs, had them on the mat at 71/4 at stumps on day 4. 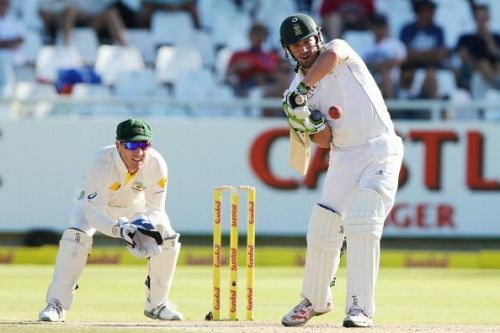 Could South Africa conjure up an Adelaide? Could they save the series and give their retiring captain Graeme Smith a well-deserved farewell? Hashim Amla, Faf Du Plessis and JP Duminy resisted briefly while Vernon Philander made an enterprising fifty, but it was De Villiers's 228 ball 43 which was the most intriguing innings of the day. He didn't play one rash shot and it was an innings which manifested his resilient character. He could have saved the day for South Africa but a Ryan Harris peach had him caught behind at 43 after batting more than 5 hours.